1. SHABBAT MIDDAY – THE PREPARATIONS ARE ON THE WAY! GOODBYE MATERIALISM: Leave your office, place of work, close store, and begin your process of disconnection from that which ties you to the disturbances of this world. ESTABLISH AN ATMOSPHERE: Buy flowers for your wife and household on the way home. Come home happily, ready to help with the many preparations, and enthusiastic to greet the holiness of Shabbat along with your dear family. POSITIVE TRANSFORMATION: Your home takes on a different color. The Shabbat Table: Set-up your Shabbat table as if the president was arriving; enwrap your table with a white tablecloth, embellish it with your finest dishes. The Queen of Shabbat will soon be here…. 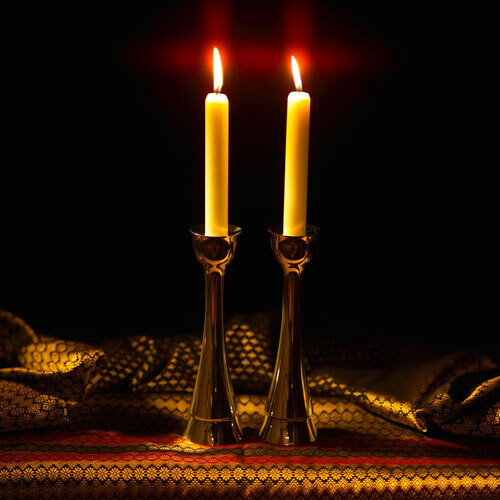 The Shabbat Candles: In addition, prepare the Shabbat candles that your wife will soon light. At least 2 candles must be lit, representing the two commandments on the Shabbat from G-d at Mt. Sinai: “Observe” and “Remember”. Some have the custom to light one candle for each family member. Your Attire: Shower and put on your finest festive clothes, which should include a white shirt, representing purity. You are about to enter into your most powerful and enriching meeting of the week. A meeting with G-d and the Queen of Shabbat. The Time-Clocks: Prepare the Shabbat clocks, which switch the lights of your house on and off. It is not permissible to switch any electricity on Shabbat on or off, since this would consist of “creating”. Creation, as defined by the Sages, is prohibited on the Shabbat since Shabbat must be ‘a day of rest’ as the Bible states, and creation would disrupt this very rest. Therefore, if you are expecting guests that may not be familiar with the Shabbat laws, it is recommended that you cover the light switches of the rooms in your house where they may find themselves, such as the restroom. 2. FRIDAY NIGHT – SHABBAT BEGINS! LIGHTING THE SHABBAT CANDLES: Make sure you know when Shabbat begins in your area. Every area has different times. Usually, Shabbat begins a few minutes before sunset. For more info, please consult your local Rabbi. The Mother and her daughters over three years old should light the Shabbat candles. The candles bring the light of Shabbat, along with its sanctity and blessings into the house. They also symbolize peace and serenity, as they ignite the peace and serenity of the Shabbat after a week of work and physical involvement. A NEW SOUL! : Kaballah teaches that on Shabbat, every Jew is blessed with a new soul. It enters the body on the onset of Shabbat, and leaves it immediately at the conclusion of Shabbat on Saturday evening. GOING TO SYNAGOGUE: Preparing your Tallit Shawl: Since it is forbidden to carry on Shabbat, one should take with him the Tallit that he intends to use for the Shabbat prayers the next day, so that he will not carry it mistakenly on Shabbat morning. Shabbat Shalom Greeting: Upon your arrival, and when upon your exit to and from the Synagogue, it is advised that you greet your fellow congregants with the traditional Shabbat greeting of “Shabbat Shalom” or “Gut Shabbos”. This is also a form of blessing which means a “peaceful Shabbat” or simply, “Good Shabbat”! FRIDAY NIGHT SERVICES: The Services in your Synagogue will oftentimes begin with the Afternoon “Mincha” prayer. Soon after, the actual Shabbat services will begin. Tunes of the prayers: Depending on the background and traditions of your Synagogue (Sephardic or Ashkenazic or Chassidic), the tunes of the prayers may vary. Yet, they are all particulary uplifting and soul-stirring. Praying in your own Language: It is preferable to pray in the language that you understand. Hence, do not hesitate to pray in English or in the language you are most comfortable with. Awareness of Surroundings: Nevertheless, one should remain attentive to his surroundings and act in harmony with the congregants (for example, stand and sit with everyone, join the singing of the classic song of Lecha Dodi, pray silently when everyone else is praying silently, and be quiet during the Kaddish!). COMING HOME: Saying “Shabbat Shalom” or “Gut Shabbos” to Rabbi: Make a point to say goodbye and Shabbat Shalom to the Rabbi of the Synagogue, as it is not only a sign of respect, but your blessing will also evoke his saintly blessing in return of Shabbat Shalom. Special Escorts: The Talmud teaches that on Shabbat evening, every Jew is escorted to his home by special Shabbat angels who bring him protection and blessings for the entire following week. So make sure to comport yourself accordingly! Invitation of Guests: Since Shabbat is an integral part of every Jew’s heritage, we must present the opportunity to celebrate it to every Jew. Thus, for many, many generations, Jews have the beautiful custom to invite guests to their Shabbat table to share the beauty of Shabbat with as many of their brethren as possible. Extend your invitation too to a fellow congregant after services, or pre-plan your invitations throughout the week. KIDDUSH / BLESSING ON THE WINE: “Shalom Aleichem”: The Shabbat meal begins with a special song in honor of special Angels of Shabbat that join every Jewish family, weekly. The Talmud teaches that two angels are present at that moment: one good, and one bad. If the household is well-prepared and unified in joy, the good angel blesses the family, expressing his wishes for the same atmosphere the following week. The bad angel is then forced to answer “Amen” to the good angel’s blessing. If they are not well-prepared, the bad angel then curses the family with the same atmosphere for the following Shabbat. The good angel is then forced to answer “Amen”. Kiddush: The Kiddush prayer is then recited on an overflowing cup of wine (symbolizing the wish for abundance of blessings). The cup of wine is held in the right hand, preferably in the palm of the hand. Kabbalistically, the five fingers surrounding the cup represent G-d’’s five attributes of mercy. Two Loaves of Bread: The two loaves of bread, also known as “Challot” are covered during the Kiddush, as to give space for the wine to reign and not embarrass the challot for our temporary lack of attention toward them. Salt on Table: Salt is also placed on the table, where the loaves of bread are later dipped. This salt is reminiscent of the salt that was placed on the Temple’s altar. Our Sages consider our tables to be altars, since the energy from the food that we eat must be ‘sacrificed’ and used to fulfill G-d’s commandments in this world. Hence, the salt on the table is a constant reminder that our tables must be treated like altars. Two Plates Per Person: The Jewish Law teaches that fish and meat cannot be mixed together, as it would be mixing the divisions that G-d placed in this world; the fish are creatures beneath the sea, and the meat come from creatures above the sea. Thus, two plates are placed for each person on the table; one for fish, and one for meat! Blessing of Children: Many Jewish fathers share the beautiful custom of blessing their children after the Kiddush, with the traditional biblical blessing that Jacob blessed his grandchildren, Efraim and Menashe. This creates a special, everlasting bond between the father and his children. BLESSING OVER BREAD: Washing of the Hands: In order to eat our dinner with purity, and treat our food with respect, we wash our hands before blessing and eating the two loaves of bread. The washing occurs as follows: Water is filled into a water-vessel. The water is then poured on the right hand two or three times (depending on the custom of the house). The same is repeated on the left hand. The blessing of “Netilat Yadayim” is the recited. The hands are then wiped with a dry cloth. No Speaking Permitted! : Speaking is not permitted between the washing of the hands and the eating of the bread. This would constitute an interruption between the two and invalidate the blessing over the washing of the hands that is but a preparation for the eating of the bread! Eating the Challah: After everyone has washed their hands, he head of the household will then proceed to recite the blessing over the Challot, the two loaves of bread. Prior to this, he will create a small cut in the top loaf of bread, to indicate the part that he will be eating. He will then lift the top two Challot and recite the blessing of “Hamotzi Lechem Min Haaretz”. He will then select the loaf of bread on the top, to eat first, as the blessing must relate to the bread that is seen during its recital. Nonetheless, at the end of the blessing, the head of the household must, for a split second, overturn the loaves of bread, so that the one that he will select will be at the bottom momentarily. This “overturn” is performed, since, Kabbalistically, the loaf of bread which we eat from on Friday night must come from the bottom. The bottom position, in general, symbolizes a person’s ability to receive. And on Friday night, we are still in the midst of receiving G-d’s special Shabbat blessings. This reception is symbolized by the bottom loaf of bread. The Shabbat Meal: The Shabbat meal is highlighted with delicious foods, usually in a three or four-course-meal, and it is well accompanied with traditional songs and some “Dvar Torahs”, commentaries on the Torah portion of the week. Flowers: Flowers are items-non-grata on Shabbat (also named by the Halachic term as “Muktzeh”), since they may lead a person to harvest his land on Shabbat. Furthermore, flowers are not allowed to be watered on Shabbat, since watering plants is considered a type of “work”, and on Shabbat we must rest! Home-made Food: Do not bring any home-made food to your hosts on Shabbat since many observant Jews follow strict requirements pertaining to the Laws of keeping Kosher. If home-made food is brought to them, they may not be able to use it, and it may embarrass you and them. Non-Mevushal Wine: Kosher wines are divided into two categories: Mevushal and non-Mevushal. Mevushal wines are wines that were professionally pasteurized and heated at a high-temperature (- this does not affect the taste of the wine at all!). Non-Mevushal wine, refers to wine that did not go through this heating process. Wine was once-upon-a-time used for idol-worship by non-Jews and some non-observant Jews. Therefore, the Sages decreed that wine that comes from non-Jews and non-observant Jews should not be used since one may be indirectly participating in idol worship and also derive pleasure from an item that was used to worship idols (a strong prohibition). But they also offered a solution: if the wine is boiled, it will not be considered pure wine anymore, and thus boiled wine can be used even if it came from non-Jews or non-observant Jews! This decree has remained with us until this very day, hence the preference to purchase Mevushal wine (as opposed to Non-Mevushal wine) for your hosts. Electrical Items / Toys: Electrical Items and/or toys are also considered items- non-grata on Shabbat as they are also Muktzeh, and may lead a person to use create and use electricity on Shabbat – a strong prohibition, as mentioned above. Mevushal Wine: For the same reason aforementioned in the “Non-Mevushal Wine” paragraph. Books: Books are always a source of interest for the members of the nation that was once named “the people of the book”. Kitchen Platters / Dishes: In homes that have many guests weekly, Kitchen items are always needed! Non-Electrical (without batteries) Toys: They are always welcomed and loved by the kids of the hosts! Ask your hosts! Ask your hosts what they would want. This can prevent much embarrassment.